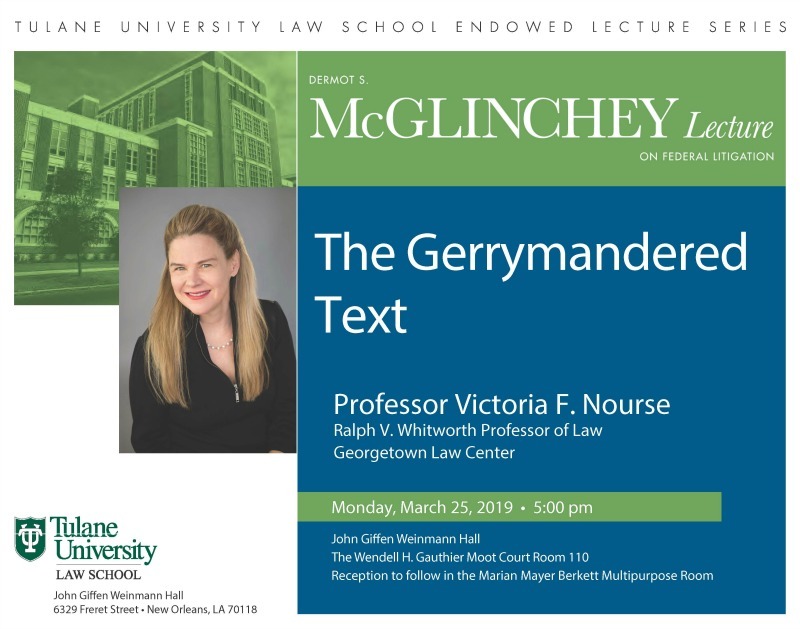 Tulane Law School is hosting its annual Dermot S. McGlinchey Lecture on Federal Litigation on Monday, March 25 featuring leading author and scholar Victoria Nourse, the Ralph V. Whitworth Professor of Law at Georgetown Law Center. Nourse is one of the nation’s leading scholars on statutory interpretation, Congress, and the separation of powers. Her latest book, Misreading Law, Misreading Democracy, was published by Harvard Press in 2016. She has also published widely on the power of the president and the separation of powers, Reclaiming the Constitutional Text from Originalism: The Case of Executive Power, and on constitutional rights, including her book, In Reckless Hands, the story of Skinner v. Oklahoma and American eugenics. She is co-author with Yale’s William Eskridge and Abbe Gluck of the most up-to-date casebook on legislation: Statutes, Regulation, and Interpretation: Legislation and Administration in the Republic of Statutes (2014 & 2018 Supp.). Nourse has had a distinguished career in government, serving as Chief Counsel to former Vice President Joe Biden. Prior to that she served as an appellate lawyer in the Justice Department and as Special Counsel to the Senate Judiciary Committee. The story of her role in the fight for the original Violence Against Women Act is told in the 2009 book Equal: Women Reshape American Law. Prior to teaching at Georgetown, Nourse held chairs at Emory University and the University of Wisconsin. She has also been a visiting professor at Yale, NYU, Northwestern, and the University of Maryland. Nourse began her legal career in New York, clerking for a legendary trial judge, Edward Weinfeld, and practicing at Paul, Weiss, Rifkind Wharton & Garrison. She left private practice to serve as junior counsel to the Senate-Iran Contra Committee under Senators Warren Rudman (NH) and Ken Inouye (HI). Professor Nourse is Director of the Georgetown's first Center on Congressional Studies. The event will begin at 5 p.m. in the John Giffen Weinmann Hall, Room 110 with a reception following. The McGlinchey Lecture is permanently endowed and sponsored by the law firm of McGlinchey Stafford. Dermot S. McGlinchey (L'57) was a civic activist and ardent supporter of Tulane Law School, and the Tulane community. He was president of the Tulane Alumni Association in 1992-93. He served the law school as a member of the Dean’s Council, chairman of the Dean’s Council Development Committee, vice chairman of the endowment program of the Maritime Law Center and chairman of the law school’s Building Fund. He devoted much of his life to promoting equal access to the courts.